There is this movie coming out called "W.E." 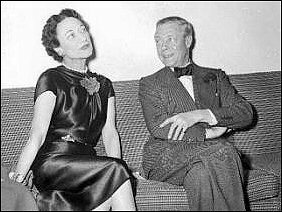 about the Duke and Duchess of Windsor. I have been looking forward to the movie and naturally all the critics cannot wait to tell me that it is a bust. Ahem. Anyway: It is probably just as well that "W.E." stinks. I mean, I would not exactly want to give Madonna money. Normally there might be a soft spot for her in my heart because she is a vestige of the '80s, but she goes around mocking out the Catholic Church, which, I mean, I don't go around getting in her face mocking out whatever it is that she loves. And also, come on, this kicking the Catholic Church, it's been done. Heck, it's been done by Madonna. She has been doing this for years. I hate that she has that name, you know? But still. I wish she had done a good job with this movie because I would be up for a decent movie about Edward and Wallis. This one looks pretty on the surface, and I do not laugh at that. Sometimes it is fun to go to see a movie for its surface. Both Edward and Wallis were great fashion plates. She was so thin and stylish and we have him to thank for the Windsor knot. I would go just to see the clothes. I mean, look at that still up above. It would be nice however if they got the other things right too. At a garage sale earlier this year I picked up the Duchess's memoirs, "The Heart Has Its Reasons." I read it in bed now and then when I need to get my mind off of Leonard Pennario and it is smart and entertaining. She wrote well. Just the parts about hanging around in America, getting divorced, before she ever meets the Prince of Wales, I found those parts fascinating. It is a great glimpse of American life in those years. She was treated unfairly in "The King's Speech" as this terrible silly shrew. She continues to be treated unfairly, it seems to me. The British hate her -- reminds you, all this did not happen that long ago. On one British newspaper site the columnist expresses what seems to be a popular view, that the Edward/Wallis affair hardly qualifies as what the movie calls it, "the romance of the century." What does qualify in these critics' opinions as the romance of the century? ... would at least be in the running! If this does not make the cut, what does? I mean, I do not approve of it, her being divorced and all, and unsuitable to the British throne. But he gave up the kingdom for her. Hello! What part of this O Critics do you not understand? I just cannot give the money to Madonna under the circumstances, just cannot. In the end I am afraid that "W.E." is not for us.